World affairs expert and intrepid travel journalist Robert D. Kaplan braved the dangers of war-ravaged Afghanistan in the 1980s, living among the mujahidin—the “soldiers of god”—whose unwavering devotion to Islam fueled their mission to oust the formidable Soviet invaders. 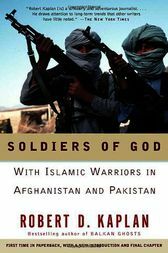 In Soldiers of God we follow Kaplan’s extraordinary journey and learn how the thwarted Soviet invasion gave rise to the ruthless Taliban and the defining international conflagration of the twenty-first century. Kaplan returns a decade later and brings to life a lawless frontier. What he reveals is astonishing: teeming refugee camps on the deeply contentious Pakistan-Afghanistan border; a war front that combines primitive fighters with the most technologically advanced weapons known to man; rigorous Islamic indoctrination academies; a land of minefields plagued by drought, fierce tribalism, insurmountable ethnic and religious divisions, an abysmal literacy rate, and legions of war orphans who seek stability in military brotherhood. Traveling alongside Islamic guerrilla fighters, sharing their food, observing their piety in the face of deprivation, and witnessing their determination, Kaplan offers a unique opportunity to increase our understanding of a people and a country that are at the center of world events.